Part A. The cost of wedding flowers has been a HUGE topic of discussion from brides and florists alike. I have been wanting to write on this topic for some time because I do not feel as though there is a lot of information to fully prepare engaged couples. Since I started by business, I have received numerous inquiries for wedding floral arrangements but there seems to be some confusion about the budget for flowers. If you have never been married or even inquired about a large number of floral arrangements before then I can't blame you for being oblivious to this topic. However, I am here to shed some light on this subject and provide you with insight into your expectations and what your budget can get you. Pinterest is everyone's best friend and for a good reason too! Pinterest provides amazing inspirational photos and allows you to create an amazing vision board for your wedding day. Heck! Even us wedding professionals use it for inspiration in our work. Unfortunately, when it comes to reality, it is usually not realistic in the money sense $$$. I want to educate you newly engaged couples that are taking that step in the wedding planning process to check off the next box: wedding flowers. When you are assessing your overall wedding budget, time after time couples do not create a meticulous budget about each category. Instead, you are probably just winging it and adding things up in your head. This can cause many problems in the long run. However, I am here to help. Keep in mind when you are planning to have fresh flowers at your wedding, you should be budgeting for about 10% of your overall budget to your floral design. You may think to yourself why should you pay that much when you can DIY it, right? Wrong. I hate to break it to you, but unless you are a seasoned florist and understand the correct way to process the flowers, arrange, store after arranging; you will be deeply heartbroken when your wedding day comes and your flowers are already wilting. Think about any other service you are paying for in order for your wedding day to be beautiful. Do you question your caterer for their prices and fees? Probably not because you realize there is a lot of time and effort that goes into the preparation of your meal. The same goes for wedding flowers. There is a lot of energy and time that goes into the processing of your flowers, cost of materials used to create your beautiful arrangements and bouquets, series of consultations and meetings to ensure your vision is executed. The flowers at your wedding are going to be one of the biggest areas of focus on your wedding day: the altar arrangement, your bridal bouquet, the boutonniere, your centerpieces. I can almost guarantee the last thing you would want your guests to see are wilted and dead flowers sitting at their table. When you invest in your flowers, your photographer will be able to capture their beauty and you will have those photos to look back on for years to come! Part B. I am going to give you a little insight into your Pinterest wedding dream boards. I am going to show you different arrangements and provide you with a starting price for each. This way you can understand exactly what your budget can afford. 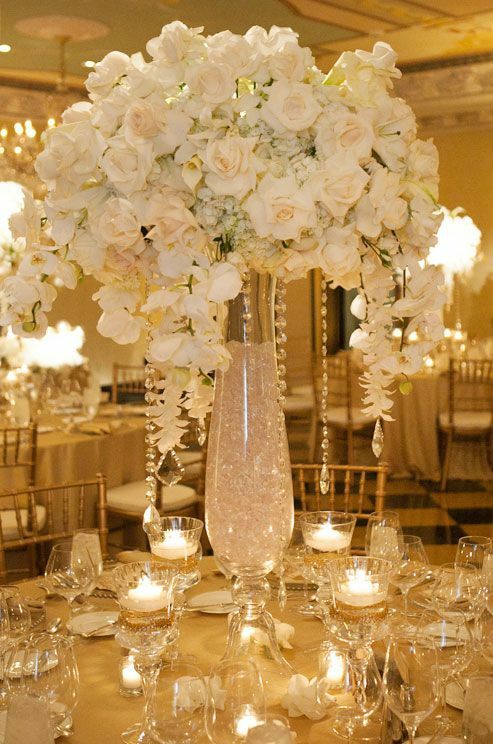 Love the tall cascade of orchids, hydrangeas, gypsophilia, and roses flowing over your guests as your table centerpiece? Then you are looking at spending close to $550 PER arrangement. An alternative to this arrangement would be a simple, yet elegant hydrangea arrangement with white carnations, white stock flower, and gypsophilia. This centerpiece would start around $150 per arrangement. These gorgeous blooms in the metallic compote vases just speak drama! With the gorgeous garden roses, white orchids, blush hydrangesas, anemones, ranunculus and much more! For this array of blooms, your starting price would be close to $220 per arrangement. A budget-friendly alternative to the latter would be a simple hydrangea and rose centerpiece with a simple vase. This arrangement would start at $40 per centerpiece (not including the vase rental). Two words. Bouquet love. Who doesn't love a super lush bouquet with garden roses and peonies to create the utmost feeling of romance? However, be ready for a price tag of $250 starting for one of these lush beauties. Looking for an alternative? This rose and hydrangea number won't break the bank. This arrangement would start around $95.There are always alternatives to what you find on Pinterest that will fit your budget and be similar to your vision. Don't cross flowers off the list because you get a couple quotes back that make your eyes pop out of your head. Your dream florist is there to help you and educate you about your wedding day flowers. That's our job!